Between the fine wine, fine dining, world class surfing, and beautiful coastline, there’s a lot to appreciate in Margaret River. 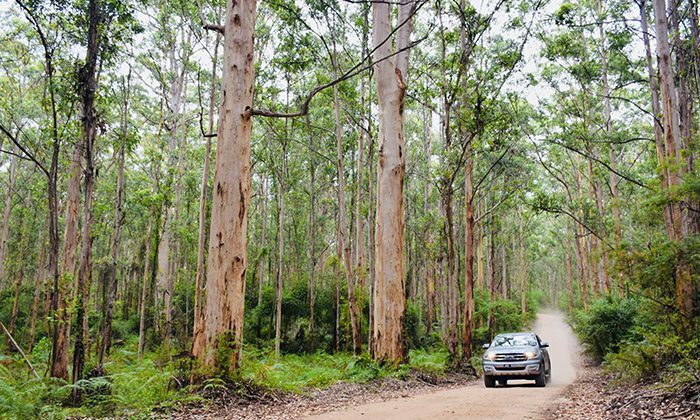 It also has one of the country’s most stunning drives, a 14-kilometre dirt road that meanders, ripples and races through the forests of hardwood karri and jarrah trees, found only in southwest Western Australia. 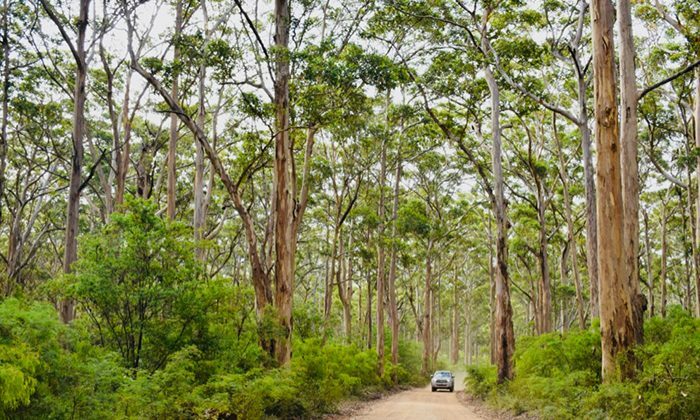 Each bend on Boranup Drive delivers another postcard, with towering trees framing the kind of road you only see in dreams, and car commercials. It’s an amazing experience for drivers, but there are many more if you sign up for a tour of the region’s many highlights. Length of Trip : Spend at least 2-3 days in the region. The Boranup Drive itself will take an hour or two. Cost : Click here for tour prices and packages from Margaret River BnB, our local operator of choice. There are no fees to enter the the Boranup Drive. We enjoyed a great breakfast at the White Elephant Cafe, and dinner at local favourite Morries was outstanding. Further out of town, Eagle Bay Brewery is a fantastic and family friendly spot to spend a sunny afternoon. We enjoyed our homely stay at the lovely Bridgewater Bed and Breakfast. The Margaret River Region is a three hour drive south of Perth. Take the Kwinana Freeway out of Perth city, and this will become Forrest Highway. Follow the signs to Bunbury and then to Busselton, travelling via the Bussell Highway. You can also try the more scenic inland route from Perth. 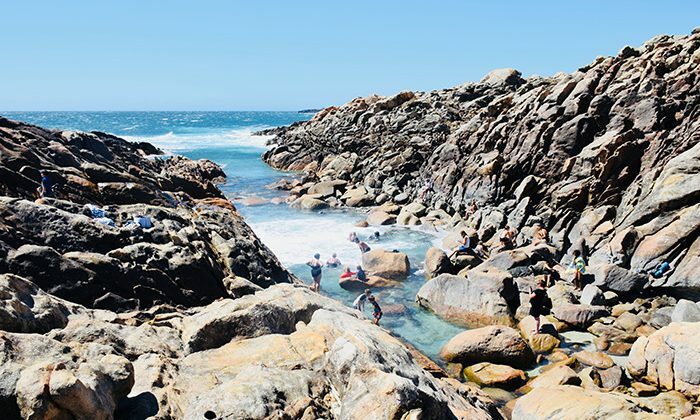 Adding an extra half an hour or so onto your trip, the South Western Highway guides you inland from the suburb of Armadale, Pinjarra, Waroona, Harvey, Brunswick Junction, Bunbury then Busselton. 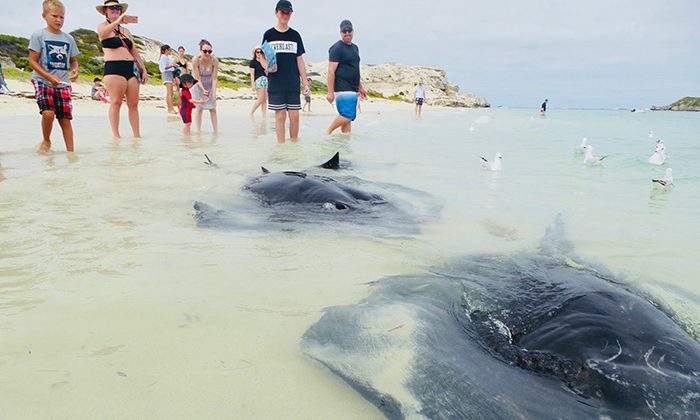 Among the culinary and natural highlights, definitely visit the Jewel Caves (easily among the country's top show caves) and Hamelin Bay, where large smooth and eagle rays come right up the shore. 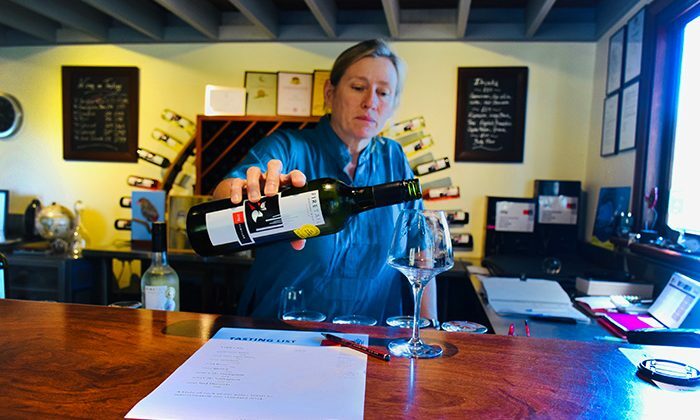 If you're going to visit wineries (and you definitely should), definitely take a wine tour to find the best cellar doors, and also take care of any driving under the influence issues. Does Boranup Drive belong on the Australian Bucket List?